330ml bottle. Clear golden beer with a small white head. Slightly stanky aroma, paper, grass, leaves. Flavor is slightly worse than the nose, watery and fermented herbs, some malt. Mouthfeel is fine, surprisingly so, feels like a decent beer, too bad it doesn’t taste or smell like one. Bottle. Pours a clear yellow color with a small white head. Has a fruity weak grainy grassy aroma. Fruity malty grainy weak grassy flavor. Has a fruity malty grainy thin finish. Bottle from ICA at Värtahamnen in Stockholm. Very light smell, hint of fruits. Similar light taste with a hint of wet grass. Light bitterness. A bit watery. Drinkable but not very exciting. 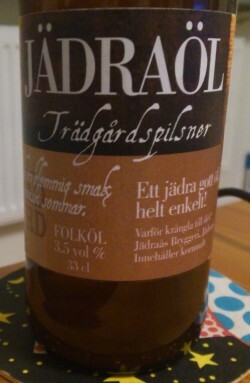 330ml bottle from Coop Reimersholme. Hazy golden, small white head that drops quickly without leaving lacing. Mid-sweet bread aroma, grassy hops and citrus. Watery mouthfeel, mildly carbonated. Taste is thin, white bread, grass, floral. Aroma is tropical (mandarines or apricot?) and not at all pilsner like. Sewage like brown color and no head. Malty sweet taste with balancing bitterness, it’s pretty ok but too sweet for a pilsner. How:bottle Appearance: light golden;small white head. Aroma: citrus, grass and some herbs. Palate: light body, average to high carbonation. Sample from 33 cl. bottle. Clear, golden colour with a thin, white head. Sweet aroma with pale malts, fruits and grasses. Taste is light bitter. Light to medium body with a creamy texture and an average carbonation. Finishes dry and bitter with a nice fruitiness. Good for a Folköl. Bottle at Papsøs tasting at Amager Bryghus. Cloudy golden coloured with a small white head. Malty aroma of hay with notes of hops and rubber. Malty flavour of hay and hops. Hoppy finish. 33 cl botle. Pours hazy yellow with a small white head. Mild fruity and light phenolic. Bitter, fruity and toasted malty. Bitter and light fruity finish.